Pilvi Dev Blog – Begin! This is the first Pilvi developer blog post. We plan on doing frequent posts about ongoing development. In this post I’ll reveal some behind the scenes technologies that Pilvi is using to power its development. 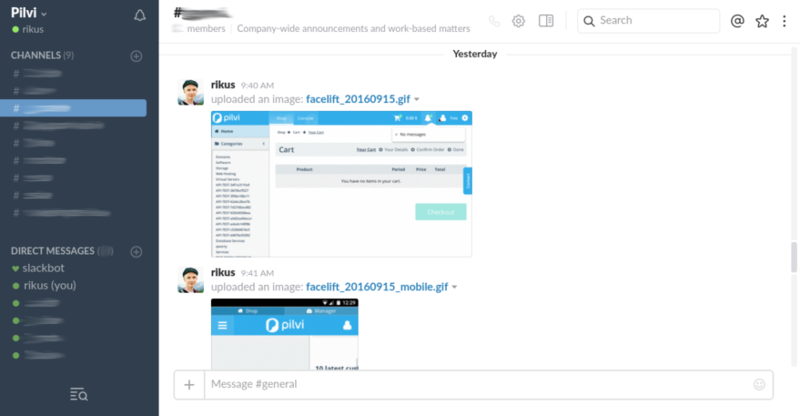 In this First post we will tell you how we use Slack, Phabricator and Jenkins. Let’s start with team communication. We recently started using Slack as our main instant messaging system. Previously we used Google Hangouts as our messaging system, but it received only minor usage among the team. I personally disliked the cumbersome workstation integration. We also recently migrated from Trac to Phabricator as our main ticketing system. Trac had served us well for the last couple of years, but its age has started to show. Over the years we mainly used Trac’s Timeline and Ticketing system to keep a track of tasks and progress. We found Phabricator, which seemed to provide us a more functional environment with some extra features bundled with it. Overall, Phabricator gives us as a more focused development portal and just after 2 months of use, Phabricator has received significantly more active use among our team. One of the most intriguing features of Phabricator, one that was actually also one of the main reasons for the migration, was the Audit feature. Phabricator’s Audit application provides a nice clean interface for post-commit auditing. Another neat feature that’s built right into Phabricator is Workboards which enables a Kanban workflow. This gives the whole team a clear view of what others are currently working on. We also receive notifications of ticket changes straight into Slack using the Phabulous Slack bot. On the first half of the year we took up on Jenkins as our continuous integration (CI) tool. Enhancing our CI process is an ongoing process, at this point we are able to produce builds for the other half of our infrastructure with a click of a single button. Jenkins gives us an overall view of the build status and history. It also has a Slack plugin, which is able to notify the team of new builds and their status. Stay tuned for the next post! Meanwhile you can check our Roadmap for planned features.